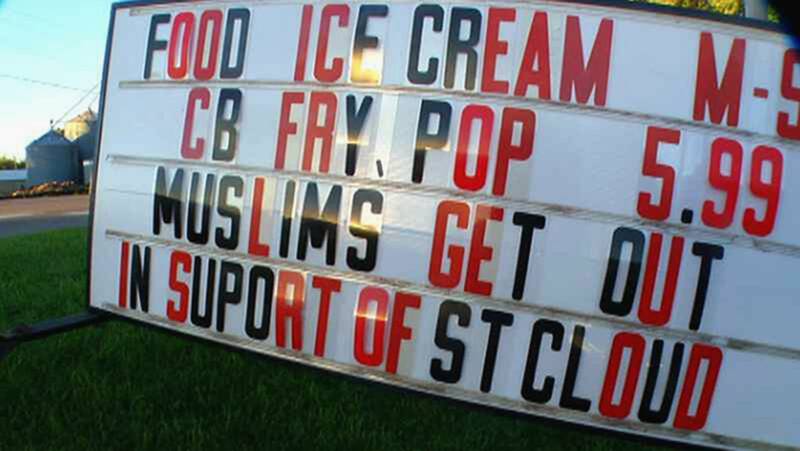 Muslim leaders on Tuesday met with the southern Minnesota business owner who's keeping a sign saying "Muslims get out" in front of his restaurant. Dan Ruedinger, owner of Treats Family Restaurant in Lonsdale, posted the sign following Saturday's mass stabbing attack at a St. Cloud mall. Ruedinger says his message is not directed at Muslims in general — only extremists — but he says he couldn't fit that word on the sign. "This was not, nor is, it directed at the Muslim population in general," Ruedinger said. "This is directed at the extremist Muslims that are destroying our country, killing innocent Americans, blowing up innocent businesses, and it needs to stop." Jaylani Hussein with the Council on American-Islamic Relations went to the restaurant and says Ruedinger was cordial, but he would not agree to remove the sign. Hussein says he told Ruedinger that Muslims are in the majority of those killed by terrorist organizations. "We weren't there to change his mind," Hussein said. "We were there to start a conversation and I think we accomplished that."